ewa-marine C-35 rain cape, Camera not included! A cheap, but effective camera protection that should be standard in every camera bag! The C35 rain cape is a good protection against rain, made to fit all kind of SLR cameras (professional dSLR are not recommended because they are too big) with standard or small zoom lenses. The cape is made of special double laminated PVC and has notches at its top which allows the normal use of the camera carry strap. 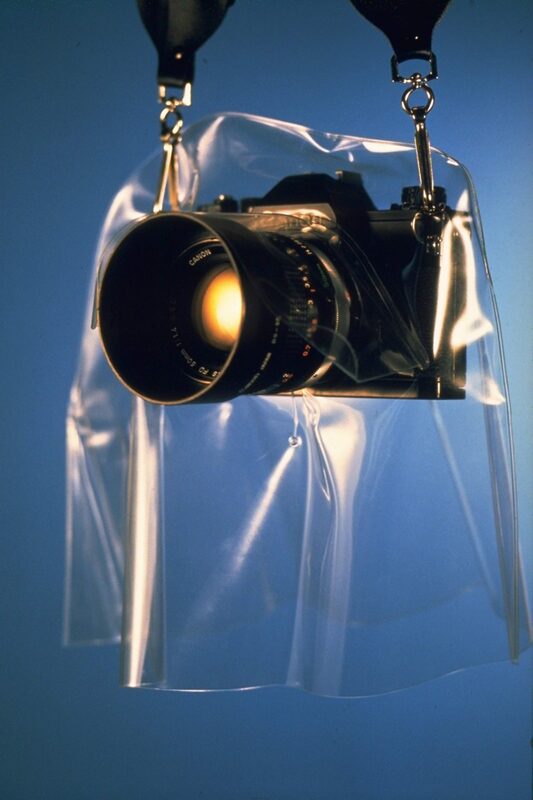 The lens is protected by means of a PVC flap which can be pulled over it and adjusted to the required length. You can use the camera with the C35 cape on a standard tripod if necessary or desired. Please note that the cape should not be used in rough conditions like heavy rain, splash water and so on, as the case does not offer adequate protection for this conditions.